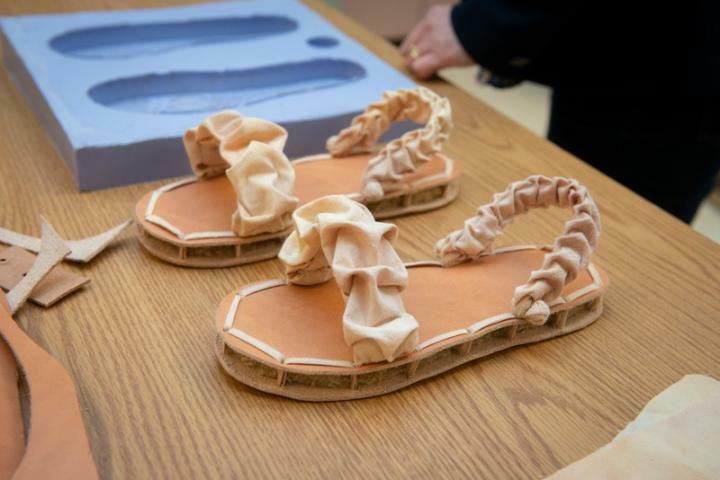 Two University of Delaware students put their best foot forward at this year's National Sustainable Design Expo, showing off a biodegradable shoe they fashioned using mushrooms, chicken feathers and textile waste. Master's degree student Jillian Silverman and undergraduate Wing Tang, both in the Department of Fashion and Apparel Studies, created a bio-composite material–renewable and sourced sustainably from common regional products–that forms the sole of their prototype shoe. The shoe and the research process that went into its development were on display at this year's Expo, part of the USA Science and Engineering Festival in Washington, D.C., April 7-8. UD's team was invited to take part after receiving $15,000 in support from the federal Environmental Protection Agency's (EPA) "People, Prosperity and the Planet" (P3) grants program. "The fashion industry produces a lot of waste, so sustainability is an issue everyone is trying to address," Silverman said. "It's hard to believe that people are going to change their consumption habits, but with this shoe, when someone gets tired of it or it wears out, it can go into the compost pile and not the landfill." The project began in 2015, when Silverman conducted research as an undergraduate Summer Scholar, working with Kelly Cobb, assistant professor of fashion and apparel studies. They were looking for ways to make fabric from mushroom mycelium, the interlocking root system from which the part of the mushroom that we eat on our pizza grows. The exploratory summer project was less than successful, but when Silverman began work on her master's degree, she said, "I just kept thinking about it. I couldn't get mushrooms out of my head." Huantian Cao, professor of fashion and apparel studies and co-director of UD's Sustainable Apparel Initiative, offered his experience in earlier research projects to create sustainable footwear from a variety of composite materials. Cao also had previously worked with student teams that received P3 research grants, and he became the faculty investigator on the mycelium project. The researchers experimented with growing different species of mushrooms and using different materials, known as substrates, in which the mycelium forms its network of roots. They grew numerous samples, dried them and tested them for potential use as the sole of a shoe. The nutrients in which the samples grew included chicken feathers and a textile waste product that's most often used as a packing material. The team hopes to experiment in the future with discarded natural-fiber clothing, perhaps shredding it to create a fluffy addition to the feathers as a growth medium. "The chicken feathers and the textile products provide the nutrients for the mycelium, and they also are a supporting material for it to grow in," Cao said. "They act like a kind of glue to form a matrix and create a network structure for the mycelium." Using textile waste from discarded clothing fits with another sustainability project that UD's fashion and apparel studies department has taken on. Working with Goodwill of Delaware and Delaware County, students and faculty are seeking ways to help the nonprofit find ways to use the millions of pounds of donated clothing that it is unable to resell in its stores each year. Once the mycelium samples grown by the research team were tested and analyzed for the best species and composition, work began on a prototype shoe. Mycelium was grown in a soft mold in the shape of a sole–"No waste from cutting it into that shape," said Cao–and the team settled on a type of vegan "leather" to cover the sole and make it more durable. Tang then designed and made the top of the shoe, using discarded scraps from the muslin fabric that apparel design students use in the clothing they create. She used a sewing technique called smocking, in which she gathered the fabric to give it bulk and shape. "I used vegetable dyes and 100 percent cotton thread," Tang said. "The design looks like mushrooms look when they're stacked, and everything is completely biodegradable." More work remains on moving from a prototype to a potentially marketable shoe, but the team is optimistic. With nearby Kennett Square, Pennsylvania, known as the Mushroom Capital of the World and Delaware one of America's top producers of broiler chickens, the new composite has an ample supply of regional raw materials. The researchers have partnered with Phillips Mushroom Farms in Kennett Square and with Goodwill, which has a recycling center in New Castle, Delaware. The feathers used so far came from a previous project involving agricultural waste. "The University of Delaware research combines the sustainability strategies of local production and the use of bio-based renewable resources to solve environmental problems related to the apparel and footwear industries," the EPA said in announcing the P3 grant award. "This year's P3 teams are applying their classroom learning to create valuable, cutting-edge technologies."